Laura Paige is a senior analyst in the Litigation Support practice area of Applied Marketing Science (AMS). As a senior analyst on the Litigation Support team, Laura works with qualitative and quantitative research projects related to aspects of litigation including deceptive advertising, likelihood of confusion, and class action. 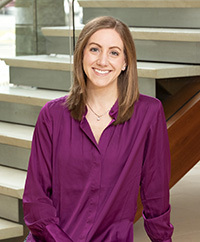 Prior to joining AMS, Laura was an academic researcher in psychology. During her doctoral studies, she investigated both memory accuracy and false memory formation across cultures and age groups using various behavioral and neural methodologies. Her dissertation examined the effects of lying on memory, investigating whether self-provided misinformation for an event leads to memory impairment for that event later. In addition to conducting research during graduate school, she also had the opportunity to teach undergraduate students in both Introduction to Psychology and Memory Distortion in Everyday Life, a course which she designed herself. Laura is from West Boylston, MA but has called Boston home for many years. She loves how walkable the city is and never gets bored finding new corners (and restaurants) of the city to explore. In her free time, Laura enjoys hot yoga and long-distance running, often followed by endless re-runs of “The Office” or any Disney movie ever made. Laura holds a Ph.D. in Psychology from Brandeis University and a B.S. and M.A. in Psychology with a concentration in Neuroscience and a minor in French from Boston College.